All about the NuForce Icon HDP. If you want to reinvigorate your present system and get into new formats. Or build a completely new high performance system from the ground up, then the new NuForce HDP preamplifier has got to be in your sights. For there are very few components out there that match its capabilities, let alone combine them in such a low cost and attractive package. – Please see the NuPrime range for our recommended new DACs and links to other options from NuForce, Meridian and HRT. This little box is the not-so-secret weapon in the NuForce arsenal and effectively creates a new product category. It's the heart of a completely modern system. While you could label it a preamplifier, a DAC or a headphone amplifier, none of these tags do justice to either its range practical applications or performance. 2. How good do you want it to sound? I want to listen to music from my laptop. I want to listen to music my computer in another room. I want to play songs from my iPod. I want to get the most out of my headphones. I want get more performance from my CD or DVD Player. I'd like to even listen to my turntable. The capability of the NuForce Icon HDP is such that it will deal with all the above. The performance far exceeds that of any comparably priced solution for even just one or two of the practical requirements above. You can match the HDP with considerably more costly amplifier and speaker solutions and still not find its limitations. 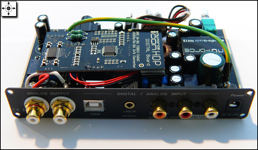 Let's look first at the Digital capabilities - The HDP supports 24 bit/192 kHz - The DAC chip consists of four internal 24/192kHz DACs that provide a fully differential and balanced output. The differential signal's DC offset operates without a need for decoupling caps. This arrangement is identical to that found in the high-end NuForce CDP-8 player. So both Optical and Coax inputs are operating at a level far above any conventional DACs and if making a connection from computer, CD, DVD or even BluRay player you can expect sound quality equal or better than all but the very best disc players. For USB we're running at 24 bit/96kHz which still far exceeds CD quality. While we don't want to get into the specification game, this is much better than many other products out there that cost considerably more. That said, the quality of the original recording must also come into play. To get the most out of the HDP it's best to be using lossless recording for storing music from disc. What's really exciting is the gradual opening up of high resolution download options - while this might not be on your horizon right now we think you'd be well advised to have a system that is capable of dealing with this - which is why we are talking about the HDP. On a straight-line sound quality comparison as a DAC we can tell you that the HDP easily bests both the Cambridge Audio DACmagic, Perreaux SXD2 and eloquence board options - all products we have had plenty of experience with. Both the latest HRT Music Streamer Plus and Firestone Spitfire MK2 products edge closer but lack anything like the flexibility of the HDP. Comparing DACs isn't a straightforward exercise - the variability in input formats can cloud differences but we have been struck by the expansive sound of the HDP - for want of a better description it just seems to have more of everything that we like - detail, dynamics, depth and richness. Critics of digital audio have rightly pointed out that some products can sound sterile, analytical flat and un-involving. It's not the format - it's the implementation. As a long time analogue enthusiast, I have to say that we have now reached the point where if I was starting again, a record player wouldn't even be under consideration (or a CD player for that matter). If we accept the inevitability - and in fact the desirability of having all our music on computer, the next logistic issue is the location of this relative to our system. For many reasons it will be possible that you'll have these separated so the big question is the transmission and control of music. 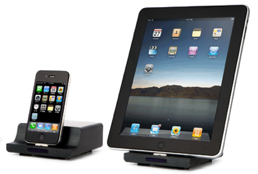 For Mac users, the iPod Touch/iPhone/iPad AirPort and Air Play family of products are an obvious solution. The HDP works seamlessly in this setting. Read more about Making Wireless Work for You. In many ways, it's the iPod Touch, iPhone and and iPad which really make things happen. As control devices they render every other remote system obsolete with Apples 'remote' ap for controlling iTunes. The last piece in the puzzle is getting music off these devices. Again, it's a piece of perfect timing with another game changing component - the new Cambridge Audio iD100 digital dock. This pulls a high quality digital feed directly out of the iPod/phone/pad which we can feed into the HDP. Only a year ago we'd have been looking at a much more costly solution that didn't come near this. As a simple system there is nothing we can see out there that even comes close. We have all of these configurations running in the shop so you can come and see and hear just how well it all works. The fact that the HDP is also a quality active preamplifier delivers even more advantages. 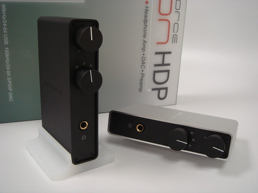 While most DACs are fixed level, the preamp section in the Icon HDP means we are able to connect to far more components and systems. Because this section is analogue, it allows us to connect any line level input - a conventional iPod dock, radio tuner or even turntable (via a phono stage such as the Cambridge 651P, the Well Tempered RIAA or theDynavector P75Mk2). The HDP may be small but the output is more than ample in power - you can drive any power amplifier, active speakers or conventional system with it. Which neatly leads to our best recommendations for matching the Icon HDP. The Quad Active speakers combine amplification and speaker into one high performance package. The value for money quotient is fantastic - you'd be struggling to find a separate amp/speaker combination that comes close under $2000 but there are a couple of practical requirements - the distance from HDP to speakers should be kept shorts as we are using interconnects rather than conventional speakers cables - 2m a side would be typical which means you'd position the system with on shelves or across a single wall. The Quads work best on stands or shelves placed close to walls. 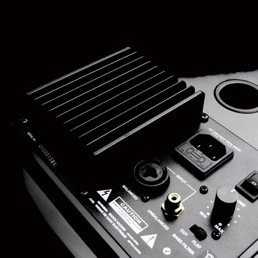 If considering other options the NuForce STA–100 amplifier is an easy choice. The STA–100 is not like any other power amplifier you will be familiar with. It is not big, it doesn’t produce much at all in the way of heat – in fact it barely gets warm. It is the perfect example of what NuForce can do – this is a radical design that will confound the pundits but thrill the music lover – a small (tiny even) cool running power amplifier with an astonishing power rating and low price that sounds so much better than we’d ever hoped. Small and affordable as it is, if you want to get the measure of the STA-100 don't restrict your speaker choice. While it will certainly make the most of any of our easily affordable and compact models from Monitor Audio, you can run any floor standers and as we've proved to ourselves at home it sounds spectacular with Sonus fabers. Another really good setting for the HDP is to reinvorgate existing pre/power systems - there are countless little Plinius combinations out there that would find new life with the insertion of the HDP, not to mention many older Perreaux, Quad and Rotel systems that are held back by old analogue preamps. The fact that the HDP actually costs less than the early Plinius and and Perreaux E series preamps it can replace really says something about how the audio world has changed. So you can see that as both a multi input DAC and Preamplifier the HDP punches well above its weight. 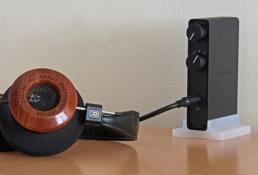 Yet there is still more to look at - as a headphone amplifier, the Icon HDP is highly capable and again sets the standard for just how good a sound you can enjoy. With ample drive and an exceptionally vivid sound, the HDP makes any decent set of headphones come to life - the fact that you can do this with multiple inputs, both digital and analogue really is the icing on the cake. "The crown jewel in the NuForce Icon range perfectly fits our definition of a realsization component. The crown-jewel application for the HDP is as headphone amplifier where it competes directly against acknowledged greats and drives anything you might throw at it. That it costs less than many of them but includes multiple inputs, a pre-out and a USB DAC goes those extra miles deep into Realsization turf as an aggressive recession buster and talented multi tasker. Really well done!" NuForce are our kind of company - their power efficiency, their use of minimal resources to deliver maximum fidelity dovetail perfectly with our commitment to organisations like WWF. The affordability, lack of artifice and clear commitment to bring fantastic sound to the masses is as close to audio socialism as we'll ever get - we think this is a good thing. The concept of the audiophile having to sell their soul to afford some esoteric, expensive and often unreliable products to extract the elusive nuance of music is redundant. It's time for a new generation of music enthusiasts who appreciate that hifi is a means to an end, not the end in itself. We think that if you've got this far, we must be of like minds and we'd love to make NuForce products work for you. We're committed to a future where high quality audio is available to many more people and we'll go the extra distance for you, making sure you get the right NuForce model, ensuring that it's matched as well as it’s possible to be with other components, and that all connections contribute to a superior end result. E mail us now, call in or even use the old phone to find out more. Making Wireless Work for You.